Chikungunya is one of the viral diseases for which no specific cure or vaccine is available .it is not new to India. An epidemic was first reported in 1963 -1965 in Kolkata. Kolkata and Kerala were the worst affected states in 2008. No specific treatment or vaccine available at present for chikungunya, so only method is prevention. 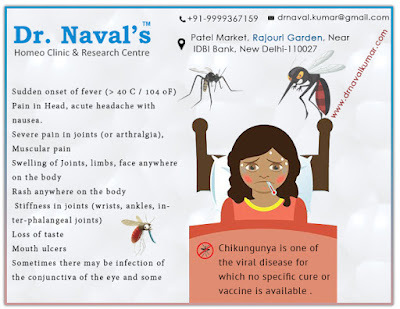 Chikungunya is a form of viral fever caused by an alphavirus that is caused by the aedesaegypti bite. Its name is derived from the “Makonde” means that which bend up due to stooped posture developed as a result of arthritic symtoms4.Chikungunya is a form of viral fever caused by alphavirus. It is spread up by the bite of an aedesaegypti mosquito. The incubation period of chikungunya is 2 – 3 days with a range of 1 to 12 days. It is an acute illness having symptoms fever, joint pain, headache, backache, arthralgia, and rash. According to sphered, homeopathy medicines gives the best result 5. There is a significant effect of Homeopathy in the control and management of the infectious epidemic disease. Dr. Hahnemann during a 1799 scarlet fever Outbreak in Germany observed that three children in the family contracted the disease, but the fourth one remains unaffected.The Fourth children had been treated with homeopathic medicine Belladonna due to a joint problem. Dr. Hahnemann himself prevented many epidemics with homeopathy. The majority of people infected with chikungunya virus turn out to be symptomatic. The incubation period is typically 3–7 days (range, 1–12 days). This means the disease manifests 1 to 12 days after the mosquito bite. The symptoms of chikungunya include the following. 2. Pain in Head, acute headache with nausea. 11. Bleeding or hemorrhage (may occur rarely). Recovery from chikungunya virus infection without any medication found in most of the patients. Improvement occurs within a few days but sometimes pain continues for a longer duration. Over 12% of patients tend to develop chronic joint pains because this virus multiplies in muscles. Detection of the virus. Viral nucleic acid and virus-specific immunoglobin in patient’s blood or plasma is confirmed laboratory diagnosis of chikungunya virus. Rapid Chikungunya Viral culture may sense virus in the first 3 days of illness. RT-PCR and ELISA is the research laboratory test for chikungunya. RT-PCR is useful for detection of viral RNA from the blood draw from the patients of infection during acute phase .level of viremia is high during chikungunya infection which lasts for four to six days after onset of illness. To confirm the diagnosis of chikungunya virus infections, RT-PCR is usually been done within first seven days of illness. ELISA is useful for detection of both anti –CHIK Virus IgM & IgG antibodies from acute or convalescent samples.It requires a large amount of blood than other tests. The result of ELISA also requires two to three days. After carefully studying symptoms of various patients and bearing in mind the Humidity of various states of India like Delhi NCR, Bombay, UP, few south Indian and north Indian states where relative humidity is more than 60 % and its considered as best for breeding of mosquitoes and the treatment modalities which corresponds to the humid weathers like Dulcamara, Aranea - Diadema, RhusTox, Bryonia-Alba, Arsenic-album, Natrum-sulph, Eupatorium perf, Rhododendron, Gelsemium etc.